First of all, I know I owe you a story about Eric. That's coming soon. I'll also post about my thoughts on the entire Notre Dame season as well. However, there is a more pressing issue I'd like to address. 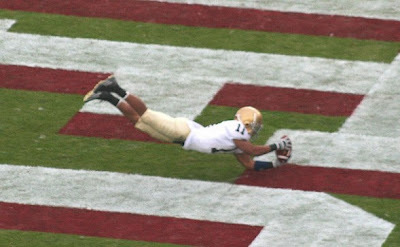 Last Saturday during the Notre Dame-Stanford game, David Grimes made an incredible catch in the end zone that appeared to put the Irish up 20-14. However, the replay booth took a look at the film, overturned the call and took away the touchdown. Things like this happen all the time in college (and pro) football and replay is there to help the referees get it right. In this case, they got it wrong. In college football the call that is made on the field is the baseline from which you review a play. In this case, the pass was ruled complete and because it happened in the end zone, a touchdown. In order for the call to be overturned by replay, the replay official must see indisputable evidence that the on-field call was incorrect. In this case, Grimes' catch. Indisputable. The replay officials only have access to the shots by the cameras televising the game and, as you can see below, there is no indisputable evidence that Grimes did not catch the ball. Watch the clip. Even the announcers are convinced that it's a catch. And those announcers are terrible - trust me, I watched the whole game. Did you see it? Did you see the indisputable evidence? No, you didn't. There isn't any indisputable evidence. The kid was robbed. The team was robbed. The Notre Dame fans were robbed. Want proof? Look closely. You see that little gray thing covering the point of the ball? That's his little finger. That's what hit the ground, not the ball. Therefore, touchdown. The official in the booth could see nothing to prove that the ball hit the ground and should never have overturned the play because he did not have sufficient evidence. He did not have this photo. By making a guess - which he is not allowed to do - he robbed David Grimes of the best catch of his career and the Irish of a touchdown. This officiating crew needs to be reprimanded for this error. I have no idea if the officials at Notre Dame have lodged a complaint, but I sure hope they have. Sure, we still won the game, but this is just another incident in a long line of incidents like this that happen when Notre Dame travels to the west coast to play USC and Stanford. Plus, Notre Dame needs to stand up for its students when they are wronged by someone outside of the University.